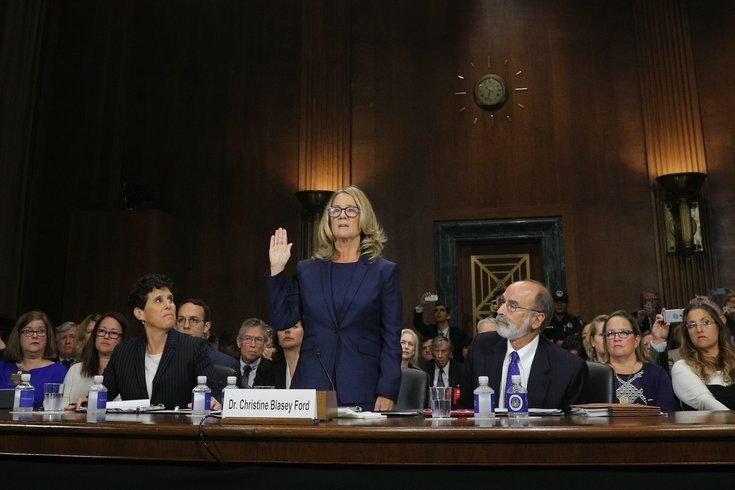 Professor Christine Blasey Ford, who accused U.S. Supreme Court nominee Brett Kavanaugh of a sexual assault in 1982, is sworn in to testify before a Senate Judiciary Committee confirmation hearing for Kavanaugh on Capitol Hill in Washington, U.S., September 27, 2018. Christine Blasey Ford testified in front of The Senate Judiciary Committee starting at 10 a.m. on Thursday. Before the hearing wrapped up around 2 p.m. she had delivered an emotional opening statement and fielded questions from Rachel Mitchell – an attorney hired by the Republicans and a special-victims prosecutor in Arizona – and the committee senators. Brett Kavanaugh was testifying before the committee at the time this article was published. You can stream it below. The hearing dominated social media and TV on Thursday afternoon with commentary, reactions, support and pushback. Here's how people watched the hearing from every part of the U.S. and how some reacted. Thank you to everyone who is here. We’re packing @OrrinHatch office and standing quietly listening to Dr. Blasey Ford.